Something I used to do alone I now do almost weekly with a dear friend of mine, Noel Love. We both love hiking, but aren't crazy hikers. So we get together almost every monday morning or on occasional cool evening and get out into the great outdoors. The photos here are from two different hikes in the evening. I'm not a morning person so I didn't think to bring my camera with me that morning. Thankfully Noel had her camera. 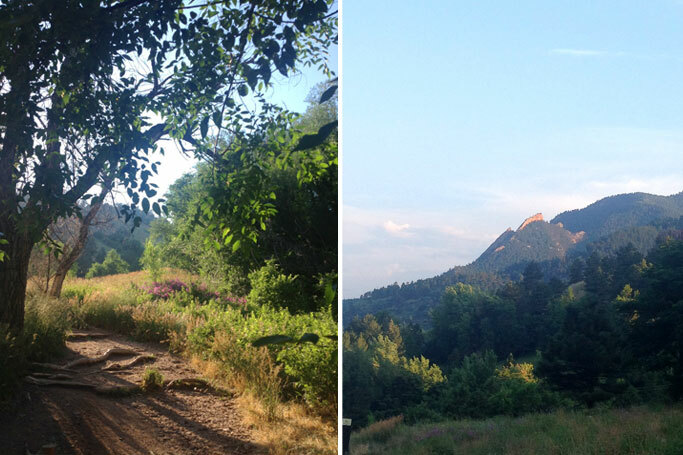 The first hike (top 3 photos) is a trail in North Boulder called Wonderland Lake Park. The hike has minimal hills and is mostly flat. We went in mid-late summer and the flowers were just blooming everywhere. The sweetpea flowers are my favorite. The other hike (photos below) is the Dakota Ridge Trail that is right below Mt. Sanitas. I didn't want to go to the top so I just hiked the stairs on the ridge to get an amazing view of Boulder and the front range.